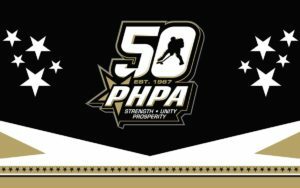 The Professional Hockey Players’ Association (PHPA) officially launched its 50th Anniversary on June 17th, 2017 in Orlando, Florida during the Association’s Annual Meeting of Player Representatives. The celebrations will continue throughout the 2017-18 season with various events and initiatives planned. Following a week long series of meetings with Player Representatives from each American Hockey League and ECHL team, the Association’s 50th Anniversary was launched in front of over 150 players and special guests during the closing banquet festivities at the Hilton Orlando Bonnet Creek. The PHPA unveiled a 50th Anniversary video which included interviews and testimonials from prominent members of the hockey community including Gary Bettman, Don Fehr, Lou Lamoriello, Brian Burke, Dave Andrews, and others, who spoke about what the PHPA has meant to the sport of hockey over the past 50 years. The PHPA also honored Brad Treliving, General Manager of the Calgary Flames, with the 2017 Curt Leichner Distinguished Member Award, which is presented annually to a member of the hockey community who has made significant contributions towards the advancement of professional minor league hockey. 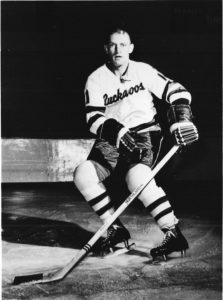 During his playing career, a group of ECHL players lead by Treliving approached the PHPA to initiate the representation process for ECHL players to become Members of the PHPA. Treliving was then invited to speak at the PHPA Annual Meeting of Player Representatives, where American Hockey League and International Hockey League Player Representatives unanimously approved the effort to unionize ECHL players. 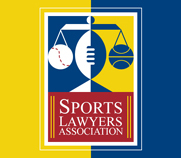 The Association also recognized five (5) former players who were instrumental to the success of the PHPA during their playing careers to serve as Era Representatives, each representing the decade in which they played. Era Representatives included: Glenn Patrick (1967 – 1977), Claude Noel (1977 – 1987), Paul Jerrard (1987 – 1997), Dane Jackson (1997 – 2007), Peter Vandermeer (2007 – 2017) who addressed the Player Representatives, recounting their experiences and involvement with the PHPA during their tenure. The banquet included keynote addresses from PHPA Legal Counsel Bob Riley, as well as Arlo Goodwin, an original Player Representative with the Portland Buckaroos who later became the Insurance Agent for the PHPA, a position he held for over 25 years. PHPA Executive Director, Larry Landon, closed out his remarks by unveiling a custom designed PHPA Harley Davison motorcycle built by Quinn Camp from Quinn’s Custom Motorcycles, who rode the bike into the banquet room and later received a standing ovation. The PHPA Harley will re raffled at the conclusion of the 2017-18 season with all proceeds supporting a number of charitable organizations. The evening was capped off by an unforgettable performance from world renowned hypnotist Danny Zzzz! Other events planned throughout the PHPA’s 50th Anniversary celebrations include a gala event in Niagara Falls, Ontario, a 6-page feature section within The Hockey News, a weekly “50 Moments” social media campaign to highlight significant moments and milestone achievements over the Association’s 50 year history, a 50th Anniversary micro site, as well as a golf tournament scheduled for August, 2018 to serve as an annual legacy event. The PHPA will begin utilizing a 50th Anniversary logo, developed by M Style Marketing. The logo includes key foundational words ‘Strength – Unity – Prosperity’ that form a solid foundation from which the Association has proudly stood. The player mark from the current PHPA Primary logo is encompassed within the ‘0’ to symbolize the players who have not only been represented and protected by the PHPA over the past 50 years, but who have helped build the Association over that same time. Since its inception in 1967, the Professional Hockey Players’ Association (PHPA) has continued to serve as an advocate of player interests. Currently, the PHPA is the certified, U.S. National Labor Relations Board collective bargaining representative for over 1,600 players across 57 teams throughout the American Hockey League and ECHL. Visit PHPA.com, follow the PHPA on Facebook and Twitter, and register for the PHPA Insider E-Newsletter.